Senator Sam Brownback is in the New York Times Op-Ed section today, in a piece entitled "What I Think About Evolution," applying enough spin to his denial of belief in evolution during the Republican Presidential debates early in May to make a Dervish envious. The details of what he writes there (and it is mealy-mouthed enough for any two politicians extant today, as shown by Mark Hoofnagle at denialism blog) is not as important to me than the fact that he wrote it at all. 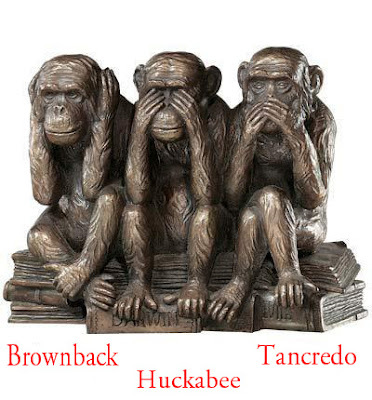 The good news is that Brownback, and Huckabee before him, feel the need to spin it. It is especially heartening that, this long after the debate, Brownback was still feeing enough heat to backtrack in the New York Times. I think that probably shows that creationism is a laughingstock among big Republican money-givers and that the Righteous Right is perceived by professional politicians to have less of a grip on the party than it once had. Gee, Toto … maybe we aren't in Kansas anymore! Tim Hotrton's drug supplier must be cutting the product again. There's this Canadian magazine called Only that I just ran across and, not only are they distinctly impolite to that nice Dr. Ken Ham and his fun and educational museum, they actually have words right out in the open that start with "f" and "v" and "d" and everything. But the word I liked best was "Scientisticalness!" It seems so perfect to describe what Dr. Ham is sel ... er ... presenting to the good folks of America at a modest cost, "to install in them the truth of Intelligent Design over flimsy evolution theory, as only a theme park can." Please note, firearms and pets are not allowed inside, except for seeing-eye dogs and guns that only shoot bad people. Given that the Bible is essentially an historical document, however, you'd think there would be some kind of record of them. Even in the Old Testament. Over the course of four thousand years of noting every minute event, every begetting, every expulsion and bar mitzvah, you would think the Jews might mention the gigantic, ground-shaking, tree devouring, shrieking and bellowing turkeylizards wandering all over the place. Just once. Those aren't bomb craters ... but they might be soon. That's a dinosaur trackway in the Picket Wire Canyonlands, part of the USDA Forest Service Pike & San Isabel National Forests Cimarron & Comanche National Grasslands. Or they will be unless and until they are included in the U.S. Army's planned Piñon Canyon Maneuver Site, a fancy name for an artillery range that will not only result in the destruction of untold numbers of irreplaceable fossils but will make whatever does survive unreachable for generations because of the danger of unexploded ordnance. Here is a site giving the contact information for every member of the Colorado Congressional delegation. Feel free to drop 'em a line or two ... even that idiot Tom Tancredo, who held up his hand at the Republican Presidential debate to show he is ignorant of science. Maybe we can convince the dolt that Noah was a little off and the Ark is up in one of those canyons. There is a good short article on Louis Agassiz, a giant of 19th Century American science who is largely unknown to the public today. An opponent of the theory of evolution and probably the last major scientific holdout against it, he had earlier dealt Darwin his most stinging defeat on the issue of the origin of the "parallel roads" of Glen Roy in Scotland. Darwin published a paper in the journal of the Royal Society proposing that these geological features were the remnants of ancient beaches. Agassiz, within only a few years, had shown that the "roads" were, in fact, striations left by glaciation during past ice ages. Indeed, Agassiz was the chief early proponent of existence of ice ages. ... Agassiz had no scientific explanation for the phenomena he observed; for Agassiz had only his observations on one side and his theory on the other. His science wasn't theoretical and his theory wasn't scientific. His ideas are edifices perched on top of mountains of data. In other words, Agassiz thought, as was common in 19th Century science, that facts were supposed to be gathered without any thought of what they might mean and only afterwards was a theory supposed to be developed to explain the facts. The problem is that the significance that a fact may have, if not the very observation of them, is dependent on what you are looking for. The color and patterns of butterflies are just pleasing trifles of nature unless you are thinking in terms of camouflage and warnings and mimicry. That leaves your preconceptions and prejudices to shape whatever theory you choose to "perch on top" of nature. Agassiz wrote to his mother of his physical disgust when he was first in close company of blacks who were serving him in a restaurant. That doubtless helped shape his support for polygenism though, to be fair, he was hardly alone in that opinion, in that a number of scientists and other thinkers, including such luminaries as Voltaire, held that there were different species of humans. However, as the first and most prestigious scientist in America in the second half of the 19th Century, Agassiz's opinion carried much weight and he cannot escape the fact that his polygenism was used, with his knowledge, as a support for the practice of slavery in the years leading up to the Civil War. Marc-Antoine Kaeser, a professor of science history at Neuchâtel University in Agassiz's home town in Switzerland, thinks that Agassiz would not have accounted himself as one of today's creationists, promoting religion in science classes. According to Kaeser "He was betrayed after his death by the Creationists." I'm not so sure. Agassiz was a creationist but not a Biblical one. He believed that the history of vertebrate life represented an unfolding of a divine plan leading to the human form and he was, in no small respects, like today's Intelligent Design creationists. In any event, a person's treatment by "history" is a contingent fact of that very history and may have little to do with the person's just desserts. At the very least, educated people should be able to place Agassiz and know something of his role in American science, if, for no other reason, than because Santayana was right. In Mosul, in 2003, it felt like we were making the city a better place. There was no sectarian violence, Saddam was gone, we were tracking down the bad guys. It felt awesome. But now, on his third deployment in Iraq, he has stopped being a believer in the war in Iraq. His change of heart came last February when soldiers killed a man setting a roadside bomb and, upon searching the body, identification showing that the dead man was a sergeant in the Iraqi Army was found. I thought, "What are we doing here? Why are we still here?" We're helping guys that are trying to kill us. We help them in the day. They turn around at night and try to kill us. It's a fair question. It's a shame that no one in the government can give a cogent answer. The closest this administration can come is that these dutiful men and women have to have to stay and go on dying and being maimed or else "the enemy" will "follow us home" to America. In short, the best excuse the president can give is that they have to stay there as decoys -- sitting ducks, really -- because the utter bumbling of the war has guaranteed that the civil war already under way will descend even further into chaos if we leave and that might be advantageous to our enemies. ... [I]n Sergeant Safstrom's view, the American presence is futile. "If we stayed here for 5, even 10 more years, the day we leave here these guys will go crazy," he said. "It would go straight into a civil war. That's how it feels, like we're putting a Band-Aid on this country until we leave here." How can we stay for even a year more, though? After spending six months in Iraq, the soldiers of Delta Company had been home for only 24 hours last December when the news came. "Change your plans," they recall being told. "We're going back to Iraq." Determination is not enough. Dedication is not enough. Bravery is not enough. In order to stay there we would need to start a draft and pay billions more in taxes to greatly expand our military to keep this up. But no politician is willing to suggest that, much less actually do it. So the young keep dying so that politicians can delay the inevitable end of this monumental error in hopes that temporizing will somehow produce a miracle or at least delay the ugly dénouement until it happens on someone else's watch so that some small part of the blame can be avoided. Nothing can diminish the good service of the soldiers, living and dead, in Iraq. They did all they were asked to by those who sent them and more. And that is worth remembering on this Memorial Day. Nothing can erase the stain the politician on both side of that imaginary aisle will bear for their craven failure to live up to their duty to those men and women. If we don't remember that, then we too will have failed to honor their sacrifice. Okay, so I'm reading Richard Dawkins' The God Delusion and, for the most part, I want to wait until I have finished the book before I comment, so as to reduce the possibility that whatever I criticize isn't clarified or changed later on in the text. Still, this one is well enough known and independent of Dawkins himself that I think it is ripe for discussion. I'm talking about Bertrand Russell's orbiting teapot example of the alleged burden of proof concerning religious claims that is adopted with a vengence by Dawkins. Many orthodox people speak as though it were the business of sceptics to disprove received dogmas rather than of dogmaticists to prove them. If I were to suggest that between the Earth and Mars there is a china teapot revolving about the sun in an elliptical orbit, nobody would be able to disprove my assertion provided I were careful to add that the teapot is too small to be revealed even by our most powerful telescopes. But if I were to go on to say that, since my assertion cannot be disproved, it is an intolerable presumption on the part of human reason to doubt it, I should rightly be thought to be talking nonsense. If, however, the existence of such a teapot were affirmed in ancient books, taught as the sacred truth every Sunday, and instilled into the minds of children at school, hesitation to believe in its existence would become a mark of eccentricity and entitle the doubter to the attentions of the psychiatrist in an enlightened age or of the Inquisitor in an earlier time. According to Dawkins, "we would not hesitate to declare our strong belief that there is positively no orbiting teapot." And, indeed, it might well be the impulse of anyone to say that it is unlikely that there is a peculiarly human object like a teapot in orbit in deep space ... given what we empirically know about space flight and how such an object might get into orbit. There is much evidence showing how hard it is to launch things into space and there have been relatively few launches into the area between Earth and Mars. Furthermore, between the motivations for those launches, which leave little room for things like teapots, and our actual records of the contents of such flights, we may well dismiss the likelihood on empiric grounds. In short, Russell, and Dawkins after him, have, by their choice of object, not only imported, sub rosa, a standard of evidence -- empiricism -- to apply to the issue but a standard we can already meet. Just for starters, what if what was being proposed was the existence in orbit between Mars and Earth of something like the monolith of Arthur C. Clarke and Stanley Kubrick? In other words, what if it was proposed that an apparently created object of unknown origin was located there? Is the case for dismissing the possibility out of hand as compelling then? It certainly wouldn't be to me and the difference results from sneaking hidden premises into the original example. A term sometimes used for such argumentation is "cheap rhetoric." John Wilkins gives an excellent explanation of agnosticism to counter Dawkins' strawman in the comments to this post at Larry Moran's Sandwalk. But I'm not really interested in that part of the debate here. Instead, I want to focus on the notion of burdens of proof as they are usually used in these debates. People frequently assert various burdens of proof along Dawkins' and Russell's lines but rarely attempt to actually justify them. I would argue that the only burden that really exists (outside of socially imposed ones, such as those in the law, intended to attain specific social goals) is an initial burden of going forward. In any debate, there must be a starting point, some issue to be discussed. One side must propose the issue and either provide some evidence for the reality of the issue or else a reason to discuss it as an abstract. It seems to me that this is a minimal burden and, once met, can either be thought of as dropping away or, perhaps more correctly, as a starting point for constant shifting burdens as each side makes new assertions and as new subsidiary issues are raised. Otherwise, the alleged burdens are just a rhetorical device to justify ignoring the opponent's evidence and arguments. Let's go back to Russell's teapot example, as flawed as it is. What evidence would be needed to meet the burden of going forward proposed by Russell? 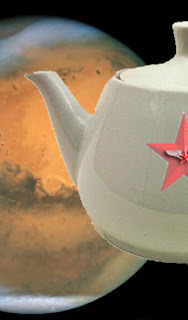 Let's say, in the happy day when a manned spacecraft is making its way to Mars from Earth, one member of the crew, idly looking out a port, sees what seems to him something mighty like a teapot (perhaps with a Soviet red star on it). The radar was not aimed in that direction at the time and there was no chance to take a picture before it was gone. In short, the only evidence is the astronaut's report. Still, an astronaut is presumably someone with some training in correct observation and someone who has undergone no little vetting for stability. More importantly, if one person's unconfirmed observation is not sufficient to meet the initial burden, why not? Other than dismissing the evidence out of hand (nothing more than an unsupported rhetorical move) any protesting of the quality or the import of the evidence is, itself, an assertion of a subsidiary issue that needs a reason for going forward on. For example, saying that the crew member was under stress and hallucinated the teapot must meet its own burden of showing that, not only was the astronaut under pressure, but was hallucinating and that the teapot was part of his or her [cough] delusion. At the very least, based on this scant evidence, the teapot would pass into Dawkins' temporary agnosticism, pending some compelling evidence that the teapot didn't exist. Razib at Gene Expression has a most useful article for countering the triumphalists among both religionists and atheists. The situation, as always, is more complex than the passionate partisans will admit. The facts surrounding the state of religious belief today and the trends that can be discerned in the data stubbornly refuse to be cast in black or white. Razib presents a sober view that will make neither side happy and, therefore, is almost certainly closer to the truth than either. Just for an example, ask yourself if the fact that only 60% of South Koreans believe in God is good news for atheism. If you think it is or you are not sure, then you need to read this article. There's a lot of nuance here, it isn't as if most religions are literalist about geocentrism. Religion adapts to the world as it is, engaging in dynamic processes of retrofitting. If supernaturalism is the cognitive default in many then the details of the religious narrative are of only proximate importance. But, I also think it is important to note that the decline of organized religion does not imply a concomitant decline in supernaturalistic or non-scientific thinking per se. Humans have all kinds of default "wild type" programs in their psyche and cognition which in a high density population will tend to fall out as religion. Does this mean that atheism is doomed? Or that secularism (which is a different thing) is doomed? I think there will be more atheists than before simply because any increase over nearly none is an increase in absolute terms, but I doubt we will ever see Lennon's society without religion. But secularism - social organisations in which religion does not have undue privileges in setting the policy and law - is, I think, something that not only should be expanded, but can be. While it not entirely clear what, in a democracy, is "undue" privilege in the context of a strongly held belief by a majority, or how to remove such privilege and remain a democracy, John's is, nonetheless, a program I can enthusiastically give an "Amen." The theme is "The Hitchhiking Skeptic’s Guide to the Galaxy." Twenty years after he left office, Ronald Reagan's name was evoked 21 times in the recent GOP debate. Not surprisingly, George W. Bush's name never came up. Indeed, all of the GOP candidates went to great lengths to distance themselves from Dubya, even going so far as to stage the debates in a library. No longer can they blame Bill Clinton for everything. Clinton ruined a dress; he did not ruin the country. Too bad the rest is simplistic sloganeering in the Reagan mode. It would have been nice if Mr. Hart's social agenda was a sharp as his wit. Surgeon on the Cutting Edge? Further examination of this device, called the Antikythera mechanism, including x-ray and CT studies, shows it to be a remarkable assembly of precisely designed gears. Many scientists believe that it was a device for predicting eclipses and planetary motion, but its precise function is still a mystery. Its resemblance to an analog computer is striking ... Archeologists believe that the technology to produce such a device didn’t emerge until at least the 14th century A.D. They have no evidence as to who designed it, and no evidence even of who could have designed it. Yet the inference to design is obvious, and no archeologist doubts that it is a designed artifact. Design can be inferred from an artifact alone, regardless of the obscurity or the implausibility of a designer. In crossing a heath, suppose I pitched my foot against a stone and were asked how the stone came to be there, I might possibly answer that for anything I knew to the contrary it had lain there forever; nor would it, perhaps, be very easy to show the absurdity of this answer. But suppose I had found a watch upon the ground, and it should be inquired how the watch happened to be in that place, I should hardly think of the answer which I had before given, that for anything I knew the watch might have always been there. Yet why should not this answer serve for the watch as well as for the stone; why is it not as admissible in the second case as in the first? For this reason, and for no other, namely, that when we come to inspect the watch, we perceive - what we could not discover in the stone - that its several parts are framed and put together for a purpose … To reckon up a few of the plainest of these parts and of their offices, all tending to one result: we see a cylindrical box containing a coiled elastic spring, which, by its endeavor to relax itself, turns round the box. We next observe a flexible chain - artificially wrought for the sake of flexure - communicating the action of the spring from the box to the fusee. We then find a series of wheels, the teeth of which catch in and apply to each other, conducting the motion from the fusee to the balance and from the balance to the pointer, and at the same time, by the size and shape of those wheels, so regulating that motion is to terminate in causing an index, by an equable and measured progression, to pass over a given space in a given time. But note that, in both cases, the inference to design comes precisely from a recognition of a human-type purpose and means of attaining that purpose. The Antikythera mechanism clearly appears to be using gears to produce calculations of some sort, the way a watch uses them to produce a consistent turning of the watch's hands. Thus, the inference to a human maker is based on our own experience of what technologies we know we use. But what experience do we have of designers using self-reproducing entities over millions of years to hone and adapt their designs to ever-changing environments? Of course, Dr. Egnor may want to deny the change in species that Michael Behe and other ID proponents admit, but then he is committing a petitio principii fallacy by assuming the very thing that he is trying to prove: that variation and selection is insufficient to produce the complex structures and processes he claims must come from design. Without an ability to rule that out as a source of the alleged design, his analogy must fail as unrealistic. Let's hope, for the sake of the good doctor's patients, that he is closer to the 21st Century in medicine than he is in his arguments for ID. Your results may vary ... as John Wilkins' and PZ Myers' did. Okay ... so I'm equal parts Militant Atheist, Apathetic Atheist and Spiritual Atheist (say what? ), with a soupcon of Angry Atheist. All that on top of 42% Agnostic and 83% Scientific Atheist. Oh, and 8% Theist (wherever that came from). I'm so confused! It's a good thing that there is two and a quarter of me to figure it out! That's how Alec Dubro at TomPaine.com describes Newt Gingrich's political philosophy but I think it could apply more personally as well. Better known for his venomous attacks and his personal sins than his church-going, Newt Gringrich would hardly seem the man to give the commencement address at Liberty University, soon after the timely death of its founder and spokesman, Reverend Jerry Falwell. Babbling about "radical secularism" Gingrich bemoaned the supposed fact that "our public schools cannot invoke the Creator, nor proclaim the natural law, nor profess the God-given equality of human rights." Strangely, as Dubro notes, despite this "growing culture" of non-sectarianism, all the Democratic candidate for president nonetheless have sought to demonstrate a relationship with the Almighty. Gingrich isn't really as smart as he made himself out to be, but he is broadly knowledgeable. He knows that religion in the United States is about as endangered as are professional sports. But he bravely stands up at a glorified Bible school and attacks people who would never vote for him anyway. Well, we've got Gingrich ... now all we need is the toe of frog, wool of bat, and tongue of dog. That's the motto of Liberty University, founded by the late Jerry Falwell. ... Campbell County authorities arrested a Liberty University student for having several homemade bombs in his car. The student, 19-year-old Mark D. Uhl of Amissville, Va., reportedly told authorities that he was making the bombs to stop protesters from disrupting [Falwell's] funeral service. The devices were made of a combination of gasoline and detergent, a law enforcement official told ABC News' Pierre Thomas. They were "slow burn," according to the official, and would not have been very destructive. Is it any accident that the university's motto appears on the school's seal along with a burning book? It's a good thing I buy keyboards by the gross. Senator Sam ("I ain't no monkey") Brownback, who famously made his case for being the second President of the 21st Century by demonstrating that he hasn't yet made it through to the end of the 19th, is shocked … shocked … that Guillermo Gonzalez has been denied tenure despite his allegedly "well-reasoned hypothesis" set forth in a popular work of supposed science published by Regnery Publishing, which describes itself not as a publisher of works of science but as the "nation's leading conservative publisher." The writing of the book was actually funded, as Ed Brayton points out, by the John Templeton Foundation, instead of a scientific organization like, oh, say, NASA. You kinda let the cat out of the bag that you haven't a clue what the word means, Senator, when you put your hand up that evening to signal your ignorance. It is beyond belief that in the 21st century, our prime minister and the Department for Education and Skills are diverting taxpayers' money to faith-based groups intent on propagating culturally divisive dogma that is antagonistic to the secular, enlightened philosophy that created the modern world. It is a scandal that the present system is enabling a car salesman to divert significant government funds to propagate dogma such as "intelligent design" in our schools. Sir Harold has a lot more to say, none of it in the least stinting in its insistence on the value of science or in its disdain for those who would stand in its way. What Are Baptists Coming To? Oliver "Buzz" Thomas, a minister and a lawyer (Whew! There's a lethal combination! ), has a new book out that goes by the snappy title: 10 Things Your Minister Wants to Tell You: (But Can't, Because He Needs the Job). Thomas makes it clear he believes that God created the universe, but that such claims are religious claims. The idea of a creator should not be part of a public school science curriculum, sneaking in as either creationism or intelligent design. However, Thomas also believes the controversy surrounding the evolution/ creationism debate should be taught in public schools as history and social studies. A perfectly reasonable position. Baptists aren't supposed to have those are they? ... there's something inside every American that is offended anytime discrimination takes place. Especially in the name of religion. And on homosexuality and marriage, Thomas advocates supporting the separation of church and state through something like the system common in Europe, where the contractual relationship is established through civil unions and "marriage" is a religious rite. Thomas acknowledges that evangelicals want to "make disciples of all nations" but he also admits that they have the right to say no and "failure to protect anyone's right to religious freedom diminishes everyone's religious freedom." I hate it when people don't live up to my stereotype. They may have lost in Kansas, but that's not about to stop creationists from trying to turn the whole country into the Kansas of their mind. Kenneth Willard, one of the remaining quartet of anti-science members on the Kansas State Board of Education is running unopposed for "President-Elect" of the National Association of State Boards of Education, a nonprofit organization of state school boards that "works to strengthen state leadership in educational policymaking." Willard is apparently qualified by his leadership in making Kansas an educational laughing stock (until even Kansans couldn't take it anymore). Having succeeded so well in that endeavor, he now turns his attention to making all of American education a laughing stock. Isn't red usually for "danger"? A few days ago I noted the story about a national effort to stop the U.S. Senate from passing legislation that some alleged Christians claim threatens their "right" to express their biblical hatred of homosexuality. Specifically, the law presently prohibits acts of violence against individuals on the basis of race, religion, color, or national original. The legislation being considered by the Senate, would add attacks based on the victim's gender, sexual orientation and gender identity. Just a week after faith-based groups denounced the House vote approving the legislation, the Gallup Poll revealed 68 percent of Americans are for the expansion while only 27 percent oppose it. Moreover, 65 percent of Protestant and other non-Catholic Christians said they would favor it. ... 64 percent of those who attend church weekly expressed that they favor the bill. Among the less religious, 67 percent of those who attend church almost every week or monthly support the expansion and 73 percent of Americans who seldom or never attend church also favor it. Even a healthy majority of conservatives, 57 percent, favor the expansion, though that is well below the 82 of liberals who approve of it. In fact, none of the groups identified in Gallup's standard categories, including Republicans, Independents, Democrats, conservatives, moderates, liberals, Protestants and those with no religious identity had a majority that opposed the legislation. So it seems that most Americans don't think their religious beliefs will lead them to commit acts of violence against others. Now all we have to do is poll the statistical category under "politicians." Tangipahoa Parish, Louisiana is vying to have the school system with the best record of teaching its students contempt for the Constitution of the United States. The local public schools have been sued over improper promotion of religion five times over the past thirteen years. I previously discussed the disclaimer the school board ordered to be read whenever evolution was taught to the effect that the instruction was to "inform students of the scientific concept and [is] not intended to influence or dissuade the Biblical version of Creation." Other cases involved the schools allowing a minister — the so-called pizza preacher — to give out pizza and teach Christianity on school grounds during lunch periods; prayers being broadcast over the intercom and promoted at school-sponsored events such as football games and at school board meetings and permitting a teacher to lead prayers in the classroom. Though most of the cases have been settled, the ACLU has had to file a number of contempt-of-court motions because Tangipahoa schools officials have defied orders set forth in the settlements. ... was told by their teacher to pick up their [Gideons] New Testament Bibles in front of the school office. The girl ended up in a line with the entire fifth grade, while two men handed each student a Bible and said, "God bless you." ... but they can't do it on school grounds, during school hours, because then it appears as though it's being sponsored by the school. It's important that people of all religious traditions be made to feel welcome in their own schools and not like outsiders. ... requires government neutrality in matters of religion and non-religion to prevent tyranny by the majority. School officials who choose to ignore that fundamental principle, especially with children involved, act un-American and undermine the very freedom and democracy that makes this country great. Being ignorant of the Constitution is bad enough but, strangely, these people who supposedly revere the Bible so much have apparently never bothered to read Matthew 22:21 either. Remember those school field trips to the museum when you were a kid? Loading onto the buses. Head counts. Soggy peanut butter and jelly sandwiches? Forget all that because the Gospel fossils Portable Dinosaur Museum comes right to your school, organization or house of worship, bringing with it the Biblically based "Scripturescope" approach of examining the scientific evidence of God's creative genius! Baird recently found a permanent home for Noah's Park, which consists of nearly $100,000 worth of fossils -- everything from dinosaur eggs to dinosaur excrement -- several displays, and a planetarium, at the Middle Florida Baptist Assembly grounds. Oh, yes ... the mobile planetarium. You can see the inflatable iglooey thingie below. The church has failed to see the importance of the history of the past. All of a child's education from kindergarten all of the way through is based on evolution, which is not only wrong and unscientific, it leads them away from the God of the Bible and the Bible. And that is why I think we're losing so many of our kids once they get into high school. Well, they're already indoctrinated and fully engrossed in humanistic, naturalistic reasons and answers for everything and they don't see how the Bible fits. Noah's Park is part of the 21st century answer to the world's solutions, Baird said. There was one thing I wished there had been more of an explanation of, namely Baird's claim about his fossils that he was "finding, often times, especially if it's a dinosaur fossil, [it was] a victim of God's judgment." I'd kind of like to know what evidence God leaves on fossils when He's pissed. You have probably heard that Jerry Falwell has lost his need, one way or another, for faith. I have no particular feelings about the news. Few if any people did more to coarsen our politics and instill anger as the permanent state of our civic discourse. He pandered to racial bias when it was convenient and safe and, when that changed, he moved on to easier targets, such as children's program characters who were not manly enough to suit the homophobes he cultivated. When he misjudged the tenor of the public who, after 9/11, were in no mood to blame that tragedy on gays or abortion doctors, he backpedaled fast enough but the ugliness always emerged elsewhere, sooner rather than later. On the other hand, his political power had faded nearly away and his real lasting influence, Liberty University, no longer needed him in order for it to continue pumping out glassy-eyed cannon fodder for the Righteous Right's war on the Enlightenment. Unlike the might-have-beens of thirty years ago, Falwell's passing now will bring no sea changes. He is just another old man to doff a hat for as the hearse goes by. Mark Hoofnagle at denialism blog reported on Wild Bill Dembski's merry band of bloggers' record of acting as "information filters" (roughly, all clogged up). However, they did catch the sneaky Darwinists this time! Specifically, they exposed the machinations that were going on over Guillermo Gonzalez's publication record and the blatent attempt by Scientific American to "disappear" Gonzalez by erasing any mention from the SciAm archives of the article he wrote for it and how it had been on the cover (the COVER? OMYGAWD! That must mean it was REALLY sciency-like!). We're perfectly happy to claim the Gonzalez article as part of Scientific American's archive. Gonzalez and his coauthors make some interesting arguments in it about why parts of galaxies may be more likely to harbor life than others. Gonzalez may think those arguments amount to evidence for Intelligent Design, but he is of course just wrong about that. Hah! And HAH again! Those people at SciAm must think the good people at Uncommon Descent are simpletons or sumthin'! The Christian Post is reporting, in an article entitled "National 'Hate Crimes' Petition Day to Flood Capitol with Protest," on a national effort to stop the U.S. Senate from passing legislation that many so-called Christians are saying may threaten their "right" to express their biblical ... well, not to put too fine a point on it ... hatred of homosexuality as they see fit, including by causing or attempting to cause bodily injury to persons through the use of fires, firearms and explosive or incendiary devices. Oh, I'm sure they won't phrase it that way, but that is what the law seeks to outlaw (under certain circumstances) so I can't imagine what other reason they'd have. You can go here to see the version already passed by the House. We must not remain silent as our liberty to freely speak the Word of God and the Gospel of Jesus Christ is being threatened by those who are framing mischief by a law. Yeah. Everybody knows the propensity of that Jesus character to use firearms and explosives on sinners. Seems to me that it's obvious who wants to engage in mischief here ... and would prefer to not have the Federal government in the way. Evolutionary theory teaches that millions of years ago a reptile, such as a lizard, evolved into the first bird. Imagine a lizard evolving into a bird. The lizard's front limbs are evolving into wings. The process will be completed over some millions of years. In the mean time, the lizard cannot run from its predators or fly away either. How would it survive? Why would such a creature be preserved by natural selection over millions of years? Imagine such a species surviving in such a miserable state over many millions of years waiting for fully-formed wings to evolve! Actually, Babu, scientists don't think it was "a lizard" or "a reptile." The best evidence is that birds evolved from (indeed, remain) dinosaurs. While we can't ever be sure of exactly which dinosaurs became birds, it was something rather like that fine fellow above, named Avimimus (meaning "bird mimic", because of its resemblance to a bird). Really, Babu, didn't you ever see at least a trailer for Jurassic Park, with all those Velociraptors and the Tyrannosaurus rex? Remember how they ran around on two legs and had those little teeny front legs? I know you religiously refuse to think but can't you even see what's practically everywhere right in front of nose? Guillermo Gonzalez, an assistant professor of astronomy and physics, whose book, The Privileged Planet, argues for Intelligent Design, has been initially denied tenure by Iowa State University. ... Gonzalez has come under criticism by the mainstream science community for incorporating the theory of intelligent design into his work. Opponents maintain that proving intelligent causes or agents is not science but rather the study of theology and philosophy. Some also have accused Gonzalez, an openly non-denominational Protestant, of thrusting religion into science. In the summer of 2005, three faculty members at ISU drafted a statement against the use of intelligent design in science. One of those authors, Hector Avalos, told The Tribune at the time he was concerned the growing prominence of Gonzalez's work was beginning to market ISU as an "intelligent design school." The statement collected signatures of support from more than 120 ISU faculty members before similar statements surfaced at the University of Iowa and the University of Northern Iowa. Academic freedom is the foundation of a university because it encourages the unfettered inquiry, debate and learning that characterize an active community of scholars and students. Consequently, Iowa State University grants academic freedom to all members of the faculty, whether tenured or not. This means that the university supports full freedom, within the law, of expressions in teaching, investigation in research, and dissemination of results through presentation, performance, and publication. As a consequence, no faculty member shall be judged on any basis not demonstrably related to professional performance, so long as the exercise of this right does not result in situations that are illegal, that violate faculty-approved university policies, or that interfere with the faculty member's ability to perform his/her duties at the university. With freedom comes responsibility. In the exercise of academic freedom, faculty members may discuss without limitation any topic related to their professional area of expertise in the classroom, at professional meetings, or through publication. They may not, however, claim the right to discuss persistently in the classroom subject matter that has no relation to a course, nor may faculty members represent themselves in extramural utterances, publications, or activities as speaking for the university, unless they have been specifically empowered to do so. When acting as citizens, faculty members are free from any institutional limitations imposed by this policy. If the Tribune story is correct, Gonzalez has clearly met the "publish or perish" requirements for tenure. Assuming that Gonzalez's book and advocacy of ID is in furtherance of his religious beliefs, his advocacy for that would seem to fall within his academic freedom outlined above, unless he was teaching it in his astronomy classes as if it is science or was claiming he spoke for the university. If there isn't something more to this story, it doesn't present a good impression of the integrity, intellectual or otherwise, of Iowa State. Why was tenure not granted to Guillermo Gonzalez? Dr. Gonzalez was evaluated for tenure and promotion to associate professor by the tenured faculty in the Department of Physics and Astronomy. That evaluation was based on an assessment of the excellence of his teaching, service, scholarly research publications and research funding in astronomy, using standards and expectations set by the department faculty. The consensus of the tenured department faculty, the department chair, the College of Liberal Arts and Sciences, the dean of Liberal Arts and Sciences, and the executive vice president and provost was that tenure should not be granted. Based on recommendations against granting tenure and promotion at every prior level of review, and his own review of the record, President Gregory Geoffroy notified Gonzalez in April that he would not be granted tenure and promotion to associate professor. President Geoffroy is also the person who will hear Gonzalez's appeal. This time it was William Lee, a Spanish teacher at Tabb High School in Yorktown, but the results were no better than they were for the Lee at Appomattox. This Lee surrendered one of the Discovery Institute's last hopes of getting Intelligent Design Creationism into public schools. Lee posted various items on a bulletin board within his classroom, including a National Day of Prayer poster, featuring George Washington kneeling in prayer; a newspaper article about the supposed religious and philosophical differences between President Bush and his challenger John Kerry; an article about how then Attorney General John Ashcroft was leading staffers in "voluntary" Bible study sessions; and a couple of stories about a young Virginia woman who had been killed while in the course of missionary activities in South America. He claimed he posted them because he thought they were "uplifting" to the students and that imparting the knowledge of these people and their values to his students would expose them to social and moral values he deemed beneficial to their emotional growth. Lee claimed this was appropriate because he is responsible for more than just the academic well-being of his students. After a complaint by an unnamed citizen about the religious nature of the material, the principal of the school, at the instructions of the school board, investigated and removed the above items. Lee, represented by the Rutherford Institute, sued the school board, claiming it had violated his rights under the First Amendment's Free Speech Clause. [W]here the in-class speech of a teacher is concerned, the school has an interest not only in preventing interference with the day-to-day operation of its classrooms . . . , but also in scrutinizing expressions that the public might reasonably perceive to bear its imprimatur. According to the Court, "disputes over curriculum constitute ordinary employment disputes and do not implicate speech on matters of public concern." In other words, the board has the responsibility to the public to decide the curriculum and, by implication, it cannot delegate that responsibility to individual teachers. There could be implications for "academic freedom" of professors in state-run universities in this sort of analysis but there are sufficient differences in the two systems, particularly in the fact that higher education is not mandated by the state and the greater presumed maturity of the students, that distinctions supporting academic freedom can be made. But the wiggle room for ID is rapidly running out. Now, I’m not questioning the integrity or complete ministry of Comfort, Cameron or The Way of the Master (their ministry). I'll assume that they are genuine Christ followers with pure motives. I'll also assume that The Way of the Master is a helpful, biblical approach to sharing Christ. But, they got completely shellacked in this one. I’ll be the first to say that I might not have done any better but I’m also not the one who threw down the gauntlet for a public debate. Perhaps as amusing as that assessment is the list of "other apologists [who] would have argued God more effectively" that was compiled by Kevin Jackson, the Christian Post reporter on the story. It notably included Phillip Johnson, Michael Behe, Lee Strobel and William Dembski – you know, the guys who are just interested in the science of Intelligent Design. Heaven is totally overrated. It seems boring. Clouds, listening to people play the harp. It should be somewhere you can’t wait to go, like a luxury hotel. Maybe blue skies and soft music were enough to keep people in line in the 17th century, but Heaven has to step it up a bit. They're basically getting by because they only have to be better than Hell. Everyone I've shown the cup to has been flabbergasted, whether they have a faith in Christ or not. Don't quote me on this Ken, but somehow I can't quite get over the feeling that Mr. Stein was engaged in something rather like jest when he wrote that. It's one thing to be a humorless dweeb, Ken, but admitting that everyone you know is too strikes me as rather sad. You may remember Matt LaClair, a Kearny, New Jersey high school student who dared to point out that a popular teacher (supposedly of American history but actually a person utterly ignorant of the Constitution of the United States) was violating the Establishment Clause by proselytizing in class on the taxpayers' time. Matt's parents filed notice that they intended to sue the school district not only for the violation of his First Amendment rights but also for the district's failure to protect Matt from harassment by other students. The LaClairs were supported by the ACLU and People for the American Way. Matt had taped the teacher, David Paszkiewicz, covertly, fearing that his word would not be accepted against that of the popular teacher. Paszkiewicz can be heard on the tapes telling students in a history class that if they do not believe that Jesus died for their sins, they "belong in hell." He also said that that dinosaurs were aboard Noah's ark and that evolution and the Big Bang theory have no scientific basis. Amazingly for someone who dares to tell others who is and is not going to hell, Paszkiewicz reportedly denied making the statements until the recordings were produced. The board's initial response was, to put it mildly, less than satisfactory. It instituted a policy that requires students to request permission from an instructor to record or videotape a class, ostensibly as a result of complaints by other students that that their voices had been broadcast on the Internet and on television news programs without their consent. And while the board said it had taken "corrective action" against Paszkiewicz, it refused to be specific, leaving the definate impression that the teacher was being wrist-slapped while the board tried to make sure no uppity students could catch him red-handed again in the future. The board and the LaClairs have now reached a settlement. Another part of the deal says the board will make a public statement commending Matthew for his “courage and integrity,” and the LaClairs will issue a statement commending the board. Demetrios K. Stratis, the lawyer for Mr. Paszkiewicz, said that his client was not involved in the settlement and knew nothing about it. “There are people who think my client is the victim,” Mr. Stratis said yesterday. The 60th Meeting of the Skeptics' Circle is up and running at Infophile. In the event that you are skeptical about this, you can click on this link. But then you might not trust me, so you can type www DOT infophilia DOT blogspot DOT com SLASH 2007 SLASH 05 SLASH 60th HYPHEN skeptics HYPHEN circle DOT html into your browser. But that could be dangerous, so you can send me a stamped, self-addressed envelope and I'll print out all the articles and send them to you. But I might just keep the stamp and blow you off. Understanding that teaching Intelligent Design is a local issue, does Senator McCain believe teaching Intelligent Design in science class alongside evolution is a good idea? Senator McCain believes evolution is supported by science, but that we shouldn't be afraid to expose students to other theories. Sounds like he's OK with Creationism being taught as well. Now as for whether he believes it should be taught as a science class or a religion clas (sic), that distinction hasn't been made. First of all, notice how easily Brody switches back and forth between "Intelligent Design" and "Creationism," almost as if he didn't believe the IDeologists disclaimers that the two are worlds apart? But also notice how hard McCain is trying not to answer the question? Maybe we should tell McCain that Osama bin Laden is just another creationist and let him hunt them to the gates of hell. Chris Ho-Stuart, has long been one of the best posters at talk.origins. For example, see his article about Herman Muller's prediction, in 1918, that evolutionary processes would produce what Muller called "interlocking complexity" but which is, in fact, exactly the same phenomena that Michael Behe calls "irreducible complexity." Anyway, Chris has a new blog that is well worth perusing, entitled Dua Quartunciae. Sorry, Chris … this won't send your site meter through the roof the way PZ did. Sometimes you just have to admire the sheer breadth of someone's vision, the audacity of their reach. Take, for instance, Jhershierra. Please. It seems that Jhershierra is the Energizer Bunny of woo. She alleges in her book and web sites that she "has been visited by Jesus, Immortals, Ascended Masters, Extraterrestrials, and other Spiritual Beings." She is "a planetary channel for the Sacred Fire," (that cleanses and purifies a person's addictions and negative qualities and heals and realigns a person's mental, emotional, and physical bodies). The Sacred Fire permits her to perform healings, exorcisms, energy realignments and the all-important "Sacred Fire Activations." She teaches the secrets of the 7 Levels of Spiritual Evolution and how to achieve mastery and immortality. She has sidelines in organic gardening, alchemy, energy technology and the Tibetan Goji, the Sacred Berry of the Himalayas (organic, of course). Religion, The Afterlife, The Astral Worlds, Reincarnation, Heaven/Hell ... All of these were created from the illusion of death. These are lies based on fears and separation from oneness with The Divine. Rise up and claim mastery over your life and victory over the world. Let Freedom Ring, Roll the stone away, It's Independence Day! Yeah, but could she load the virus into the mother ship's computers? NEWSFLASH! ID's prediction that the sun will rise this morning is confirmed! Large swaths of garbled human DNA once dismissed as junk appear to contain some valuable sections [specifically, certain transposons], according to a new study by researchers at the Stanford University School of Medicine and the University of California-Santa Cruz. Now, I freely admit that I don't understand transposons but, unlike the people who Luskin hopes to fool, I can read the article from the Talk Origins Archive and am willing to make the effort. First of all, the point of a prediction in science is that it has to confirm something that either was previously unknown or something that is in contradiction to an opposing theory. You couldn't choose between Ptolemy's and Copernicus' theories based on the sun appearing to rise in the morning. ... confirmation and potential falsification are independent of whether a specific pseudogene has a function or whether it is completely non-functional, for the same reasons explained in the prediction on morphological vestiges. Like any other genetic element or organismic structure, evolutionary opportunism may take a pseudogene and press it into a new and different function. [Bejerano] suspects that when a transposon is plopped down in a region where it wasn't needed, it slowly accumulated mutations until it no longer resembled its original sequence. The genome is littered with these decaying transposons. When a transposon dropped into a location where it was useful, however, it held on to much of the original sequence, making it possible for Bejerano to pick out. In other words, evolutionary theory does not predict in any sense that transposons will be funtionless, so what some crank once said, without any evidence to back it up, about "junk DNA" lends no support to ID over evolution. And the still-valid evidence that transposons give for common descent in no way retarded the discovery of the function that some of them may have. But here's a prediction of my own: the region above Casey Luskin's neck will remain functionless for the foreseeable future. Oh, and as Mark Hoofnagle points out at denialism blog, Casey's own quote (in a part I didn't include for brevity's sake) shows that evolutionary biologist and Nobel laureate Barbara McClintock, who first discovered transposons, was proposing as far back as 1956 that they had function. Talk Origin's time machine allowed Doug to go back and stifle McClintock, apparently. Darwinism's impact on traditional social values has not been as benign as its advocates would like us to believe. Despite the efforts of its modern defenders to distance themselves from its baleful social consequences, Darwinism's connection with eugenics, abortion and racism is a matter of historical record, and the record is not pretty. An Ohio woman is steaming after reading an anti-God message published on the side of a Starbucks coffee cup. The quote was written by Bill Schell, a Starbucks customer from London, Ontario, Canada, and was included as part of an effort by the Seattle-based coffee giant to collect different viewpoints and spur discussion. "As someone who loves God, I was so offended by that," Michelle Incanno, a married mother of three who is Catholic, told the Dayton Daily News. "I don't think there needs to be religious dialogue on it. I just want coffee."